Three workers have been exposed to harmful doses of radiation while working at the Fukushima nuclear power plant in Japan. 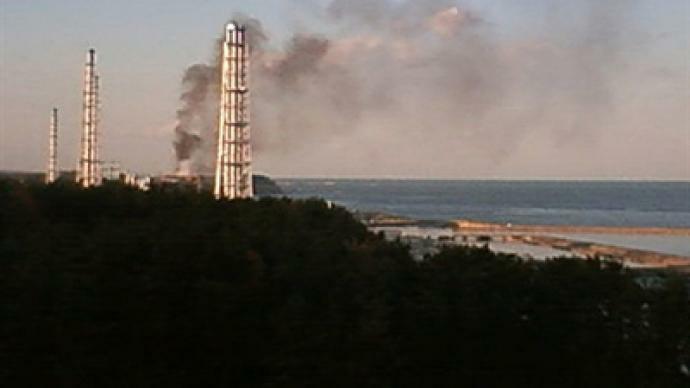 There have been reports of a rise in temperature and new plumes of smoke rising from one of the reactors. The three men in their 20s and 30s were exposed to high-level radiation while laying cable at Unit 3 of the facility, Kyodo news agency reports. 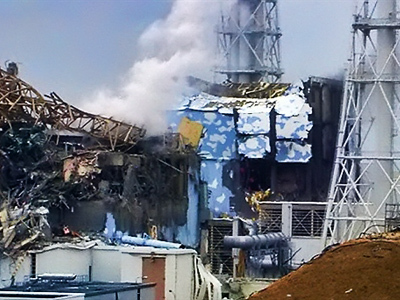 Two of them have been taken to a hospital due to possible radiation burns on their feet, the plant operator Tokyo Electric Power Co. (TEPCO) announced. 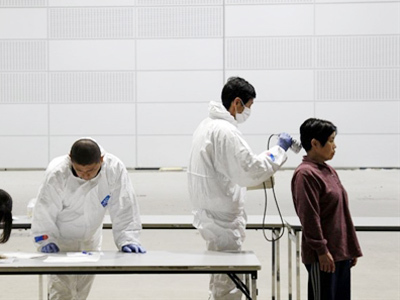 The men were working with their feet immersed in water and, according to TEPCO, radioactive water may have seeped through the workers’ radiation protective gear. The burns were caused by direct skin exposure to beta rays. The plant operator also announced that in the course of the restoration work at the Fukushima facility, 17 people received a dose of radiation, which exceeds the annual norm set for workers at nuclear facilities, Itar-Tass news agency reports. The country's struggle to resolve its nuclear crisis was stalled once again on Wednesday, with plant workers evacuated after black smoke emerged from reactor 3. It also forced work suspension at reactors 1, 2 and 4. 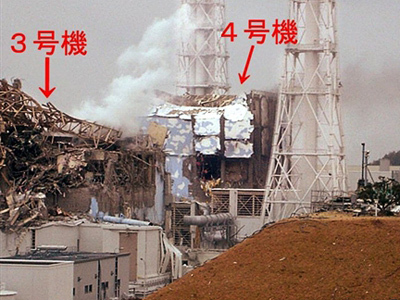 On Thursday morning, after confirming that the black smoke was no longer visible, TEPCO, the operator of the plant, resumed injecting water into the pool to cool the spent fuel rods at reactor 3. The engineers were allowed to return to the facility, but within several hours some of them were withdrawn for reasons still unknown. Later in the day, the company is also planning to continue attempts to restore the reactor’s cooling system and reactivate external power to the control rooms at the building of reactor 2. Work at Reactor 5 was disrupted on Wednesday, and since then the reactor has been consuming electricity from a diesel power generator. 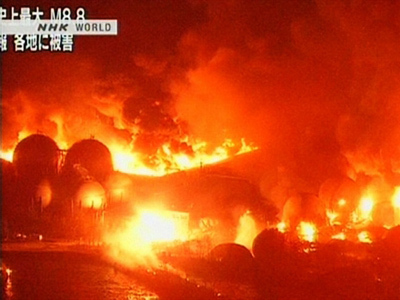 TEPCO has pledged to re-connect it to regular power lines on Thursday as well. The company reports that electricity has been restored inside the control room on the premises of reactor 1. Meanwhile, the measurements at the reactor’s container show that pressure inside it has dropped. Due to a rise in pressure, which was measured on Wednesday, TEPCO cut back on the water injection early on Thursday, and this has led to the pressure decrease. As of Thursday, the reactor remains stable, but monitoring will continue. Nuclear experts do not believe that the cooling systems at reactors 1 and 2 can be restored, as the power lines there suffered too much damage during the earthquake. Experts worry that the nuclear fuel at reactor 1 might have melted down, as the temperature inside the reactor currently exceeds 400 degree Celsius, while the working temperature is 302 degrees. Reactor 1 is believed to be the most troubled of the six reactors at the Fukushima-1 nuclear power plant, as stated by Japan's Nuclear and Industrial Safety Agency. 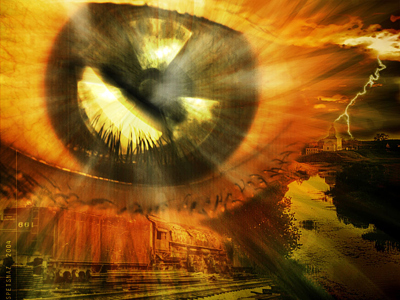 The agency fears a total nuclear meltdown at the reactor which may be triggered by the hydrogen explosion. They are looking into the possibility of opening the reactor’s gate to let out the steam, which would allow decreasing the pressure inside the reactor and preventing its destruction. ­Japan’s government is worried that radiation contamination spread by the Fukushima-1 nuclear power plant might exceed the 30km exclusion zone, after a computer model showed on Wednesday that some areas outside the zone would exceed 100 millisieverts, the level that could affect the human thyroid if a person is exposed to it outdoors for 24 hours. Radioactive iodine concentration in the sea waters near Fukushima-1 has exceeded the safety level by 147 times, as measured by TEPCO, the operator of the plant. Japanese authorities have also detected a concentration of a radioactive substance 1,600 times higher than normal in the soil at a village 40km away from the troubled nuclear power plant. In the region around the plant, residents have been told to avoid some local produce, as more and more countries, such as the US, Canada, Australia and Russia, halt the import of certain foods from Japan. Japan's Nuclear and Industrial Safety Agency has published guidelines on the Internet for people living outside the 30km exclusion zone around Fukushima-1 nuclear power plant. According to the guidelines, radiation levels outside the zone are too low for rain to pose a health threat. The guidelines also say that vegetables homegrown beyond the zone are safe to eat, unless they come from areas from which the shipment of produce is banned. The guidelines also state that residents do not necessarily have to take iodine pills at present. ­According to the National Police Agency, 9,523 people have been confirmed dead in Japan after the country was hit by a 9.0 earthquake followed by 23 meter tsunami. 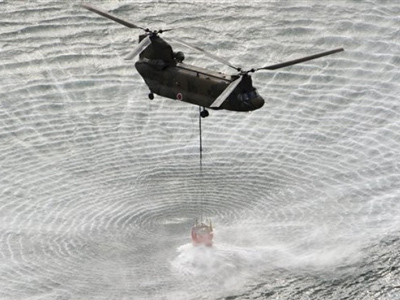 The agency says it has received reports of 16,094 people missing. Most of the dead and missing are from the three hardest hit prefectures of Miyagi, Iwate and Fukushima. The agency says at least 18,000 houses were destroyed by the quake and tsunami, and more than 130,000 homes were damaged. Over 200,000 people are still living at emergency shelters, according to Japan’s NHK broadcaster. Some survivors have returned to their homes in areas where essential services have been restored, but they are still suffering from shortages of supplies.